Today, we are on third and probably the most coveted step in the Creative Process – Inspiration & Insight. As we’ve discussed, Inspiration & Insight is so coveted, even craved, that a lot of us skip the first two steps (Sponge Work & In the Flow) and start our creative projects searching for, seeking out and trying desperately hard to have THE BIG IDEA. 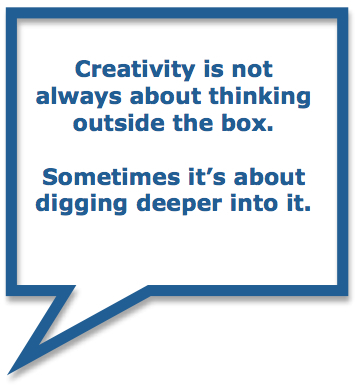 Certainly, it can seem, from both the inside and the outside, that big ideas just happen. Even more, that they just happen to some people. The lucky ones who are creative. And I won’t deny that it can just happen – sometimes. But more likely, when big ideas do just happen, the creator has been either doing Sponge Work and spending time In the Flow naturally, as part of who they are, or unconsciously, in that they are doing sponge- and in the flow-like activities, but have not named it that. For example: I read a passage in a book that strikes a big idea for one of my clients. The idea came out of nowhere. It just hit me. But the fact is that my reading in the first place was unconscious Sponge Work and my mind focused both on the book I’m reading and on other things – like my client – was me being In the Flow. The reality is that inspiration, by definition, comes from some something – internal or external. And insight, by definition, is the “ah-ha” conscious connection that makes us say, “I’ve got an idea!” It took some kind of “work” to get there. Whether that work was hard or easy; conscious or unconscious. The Inspiration and Insight step is interesting because it belongs in a category by itself, but flows out of In the Flow and into Make it Real – the final step. It straddles the line. It is both its own finite step AND it’s got feet in the steps around it. As a step in itself, Inspiration & Insight is a build up of creative energy, plus an eye-opening moment in the creative process – “moments” if you’re having a string of insights. Creators typically don’t stop In the Flow and say, “I’m moving to Inspiration & Insight now.” Instead, inspiration occurs from In the Flow and tells you that you are now in the Inspiration & Insight step. As with many parts of the creative process, there is a potential trap here. A trap that can trigger the, “Oh, see, I’m not creative after all. I can’t make anything work!” response. Because inspiration feels the way it does – like you are on fire with creativity (which you are) – it can be easy to grab an inspiration from the first part of the step and begin to create the final outcome. That is OKAY! No rules here. But when you do this, before having the big ah-ha (the insight), ideas tend to get slippery. Even fall apart as you begin to make them real. At some point, you’ll need both the inspiration and the insight to make it real. One way to look at it: Inspiration signals the beginning of the Inspiration & Insight step and insight signals the end. Inspiration tells you that you are onto something – or a lot of somethings. Insight tells you that you’ve got “it” – that it’s time to take “it” and Make “it” Real. When your inspiration has lead to an insight, the idea you take into Make it Real has a better chance of staying solid and growing stronger, not weaker, from there. It is a fully realized inspired insight and, therefore, easier to work with. The trick is to stay with inspiration until you get the insight – the clue to what you will do with your inspired thoughts, chords, clay, etc. – and, then, you make it real. What most of us know about Inspiration & Insight is that it often happens at the wrong time. While driving, while in the shower, while on the StairMaster, while walking in a meadow with nary a pen in sight. There’s a biological and physiological reason for this. A different part of the brain opens up during these activities. Our mind has been actively engaged in Sponge Work and In the Flow, we move on to something mindless, and, as a result, our mind becomes more. The wonderful part of this step – getting the big ah-ha – is that we are often compelled by a force bigger than ourselves to get take our ah-ha to the next level. To create an actual creation. That’s stupid. That will never work. You don’t have the skill to pull that off. Who are you to think so big? That voice simply requires a little saboteur management. You don’t even need to shut it up, you simply need to navigate around it. In fact, trying to make saboteurs disappear is darn useless. If you accept them as part of the creative process – if you know that the bigger and better your insight the more likely your saboteurs are going to have something to say about it – then you can use their appearance as proof you are going in the right direction. For more on internal saboteurs, read Tips & Trick for Navigating Your Internal Saboteurs. I’m hoping you’ll share your inspiration and insight about Inspiration & Insight: Where are you when your big ideas come? Have you had the experience of watching your inspiration go slippery? How do you know it’s time to create? NOTE: Above I wrote “Creators typically don’t stop In the Flow and say, “I’m moving to Inspiration & Insight now.” AND sometimes they do. We’re going to cover the “choice” aspect that exists in the creative process (both for all creators and for creative professionals) after we move through the four steps.